“When the whole family helps prepare a meal, cooking dinner feels less like a job and more like a party. Skewers are especially fun to cook because they allow kids to create and personalize their own meal rather than be handed food that someone else chose for them. The more meat, seafood and vegetable options you provide, the better. It gives both kids (and adults) a chance to be creative and adventurous. 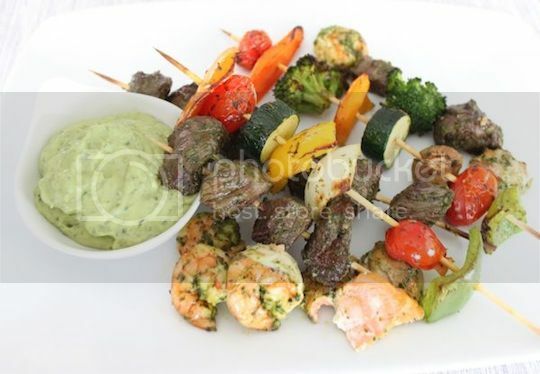 Don’t exclude proteins or veggies that you think your family won’t eat – you might be surprised by the colorful and healthy skewers they put together. This recipe plans everything out for you, combining a wide variety of proteins and vegetables in a flavorful basil marinade. The avocado sauce served on the side is optional, but most kids love to dip their food into something. You can also consider serving homemade Ranch Dressing, ketchup, or mayo on the side.